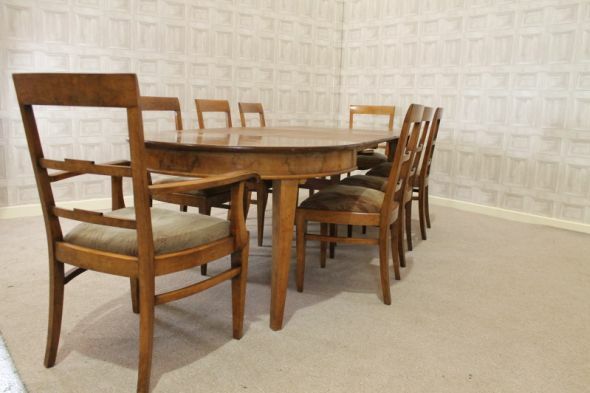 This Art Deco dining room set is a fantastic addition to our large and extensive range of antique furniture. This extremely rare large extending art deco dining room suite comprises of eight matching chairs, and one burr walnut dining room table. The table has four additional leaves which conveniently store beneath the centre of the table. The table is extremely sturdy as it has a centre drop down leg to support the additional leaves. The table and chairs are complemented by a matching maple lined display cabinet/sideboard. All of these items are in good condition for their age with just general wear and tear. We have not re-covered the seats as we believe that the chairs still retain their original art deco material which could be salvaged (this is down to the customer). A fantastic suite for any large dining room.